In order to continue to keep Big Data: Understanding How Data Powers Big Business a living book, this blog should be added to Chapter 8: Big Data User Experience Ramifications. 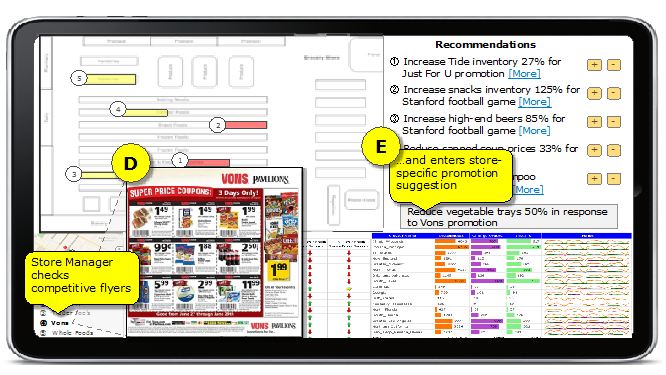 I recently had the opportunity to run a vision workshop for a grocery retailer. The goal of the session was to identify how they could leverage big data and advanced analytics to deliver actionable insights (or recommendations) to store managers with the goal of helping the store managers improve store performance. Big data can transform the business by enabling a completely new user experience (UEX) built around insight and recommendations (versus just data and charts). Retailers, like companies in many other industries, can leverage detailed, historical performance data—coupled with new sources of “right-time” data like local competitors’ flyers/promotions, weather and events—to uncover new insight into their customers, products, merchandising, and competitors. Big data provides the ability to 1) rapidly ingest these new sources of competitive, customer, product, and campaign data and then 2) leverage advanced data management and analytic techniques to yield more real-time, predictive, actionable insight. I love getting the chance to leverage big data to unleash an entirely new user experience that drives new monetization opportunities. Big data provides an opportunity to think differently about how we power a more relevant, more actionable user experience that can directly improve business performance. Let’s walk through the example that we developed. We started with a traditional store performance management dashboard mockup. This performance management dashboard provided the key performance indicators (KPIs) against which the store manager measured the performance of their store. The dashboard also presented trends and previous period comparisons for those KPIs. This is pretty standard business intelligence work (see section A of Figure 1). However, the top part of the dashboard (sections B and C in Figure 1) is much more prescriptive in making recommendations concerning pricing, merchandising, inventory, staffing, promotions, etc. for each individual store. Section B shows specific product, promotion, placement, and pricing recommendations based upon the layout of that specific store. Section C lists the recommendations with more details. 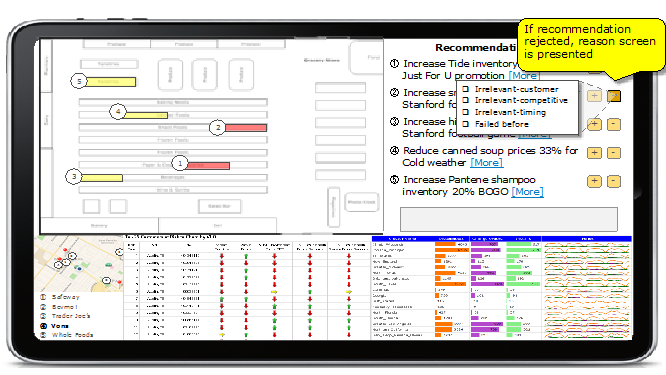 Each recommendation has a [More] option that enables store managers (or their business analyst) to drill into the details about the specific recommendation including the performance and trending of key metrics, predictive propensities, scores, and forecasts. Each recommendation is presented with an accept [+] or reject [-] option. 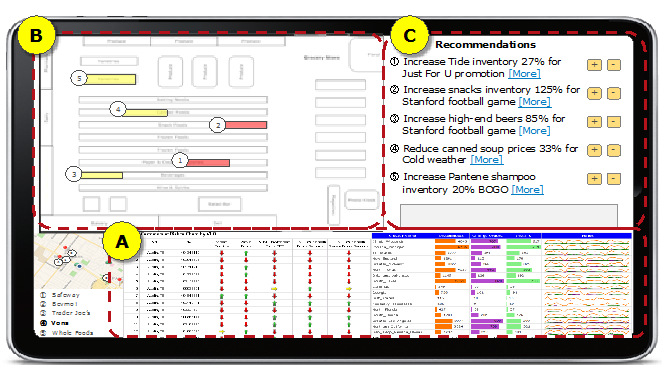 If the store manager accepts the recommendation by selecting [+], that recommendation is executed (e.g., raise prices, add promotion, add inventory, etc.). However, if the store manager rejects the recommendation, then the UEX/dashboard tries to capture the reason for the rejection so that the supporting analytic models can be constantly fine-tuned (see Figure 2). The supporting analytics will measure the effectiveness of accepted recommendations (e.g., actual outcomes versus predictive outcomes) so that the store-specific analytic models can be continuously refined. One use case has the store manager monitoring local competitive activity and promotions. The grocer industry is very locally competitive. Competitors, for the most part, are within just a few miles of the store. In this use case, the dashboard provides a map of the local grocery and beverage competitors (see section D of Figure 3). Hovering over any particular competitor on the map immediately brings up their current flyer. The store manager (or their business analyst) can browse through each of the competitors’ flyers, and make custom store recommendations (e.g., pricing, promotion, merchandising, inventory, staffing, etc.). 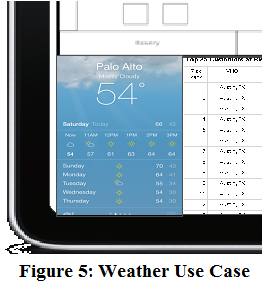 See section E of Figure 3. Like the other recommendations, the store manager’s custom recommendations will be monitored for effectiveness so that the analytic models can be constantly updated and refined. 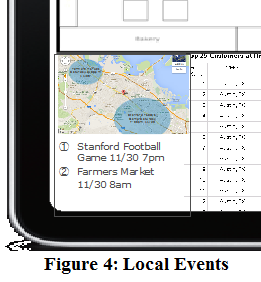 events calendar highlights two events: 1) Stanford college football game (which should increase the sale of beer, chips, burgers, and other tailgating materials) and 2) Farmers Market (which should decrease the sale of fresh produce and fruits, and other organic items). The dashboard could automatically analyze the results of previous local events and predict how those events might impact store traffic and the sales of specific product categories. (see Figure 5). The dashboard can automatically analyze similar weather conditions and predict the impact on store traffic and product category sales. The dashboard could even couple the competitive activities, local events, and weather data to predict what sort of impact the combination of these might have on store traffic and product category demand. These insights could yield new recommendations that drive the store manager’s decisions about merchandising, staffing, and inventory. Big data can power an entirely new, more relevant user experience. Instead of over-whelming the business user with an endless array of charts, reports, and dashboards and forcing users to “slice-and-dice” their way to insights, we can instead leverage the wealth of available structured and unstructured data sources, in real-time, coupled with predictive analytics to uncover those insights buried in the data. We can build upon those insights by providing recommendations and then measuring the effectiveness of those recommendations so that we are continuously refining our analytic models. And, as the Big Data Business Model Maturity Index indicates, recommendations (as part of the Business Insights phase) are the natural next step to the Business Optimization phase, where we turn the decision processes over to the analytics. By the way, I’ll be working on other use cases that I can build from this store manager dashboard. Please let me know if you have any suggested use cases. This post should be compulsory reading for everyone in BI and in particular those involved with BI and “big data” as it paints one of the best visions for what end-user BI should be that I have come across for a long time. Too much of the hype around big data at the moment incites people to head off on exactly the wrong path which I would characterize as “let everyone stick their head in it to see what they find”.